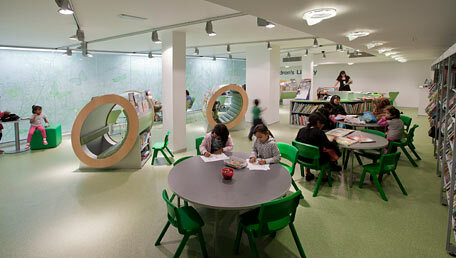 Bisset Adams has redesigned Church Street library near Paddington in Westminster, to create a spacious and vibrant community hub. Bisset Adams was tasked with redesigning Church Street library near Paddington in Westminster, to create a spacious, vibrant community hub. We responded to this by opening up the lower two floors of the building, formerly back offices and a garage, enabling a vast expansion of space. The library had previously been hidden at the end of an alley between retail units, so the brief also required an increase in the visibility of the library, and for the library to act as a ‘green oasis’. Church Street public library reopened in August 2010, following a Big Lottery-funded transformation into a vibrant community hub, providing state of the art facilities for local people, including a new children’s library, whilst also boasting a dedicated space for young people, new learning centre, community space and zoned areas to meet the needs of its different users.